The Hague, Netherlands, 16th of April 2018. 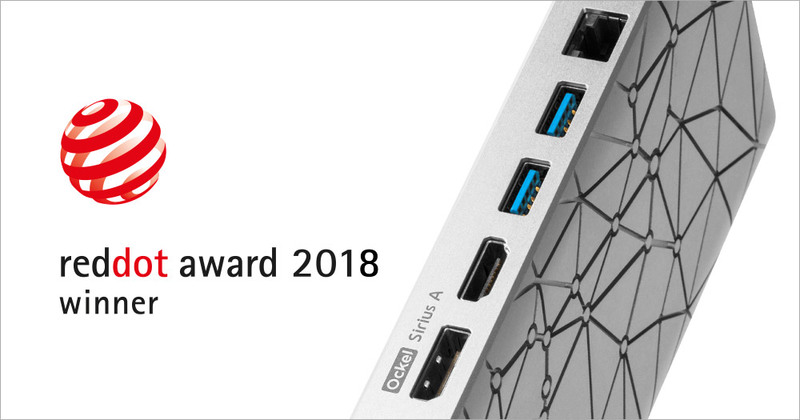 The Red Dot jury has made its decision: After all of the products submitted were tested and assessed individually in the course of an evaluation process spanning several days, the Sirius A, designed and manufactured by Ockel Computers, received the distinction “Red Dot”. The panel of experts awards the internationally recognised seal of quality only to products that win them over with their high design quality. The mission of Ockel Computers is to reinvent the PC. The Ockel Sirius A is the only computer that combines connectivity, power and portability in such a unique way: a full Windows 10 computer in your pocket. The unique, patented, wedge shaped design enables us to integrate all the ports customers need to expand to a full-fledged workspace. The touchscreen device, with an eye-catching anodized aluminium heatsink in the shape of the Canis Major constellation, requires no ventilation fans, which makes the device 100% silent. The revolutionary Ockel Sirius A has raised over 900,000 dollars in crowdfunding so far, which shows the market potential and consumer interest. The Red Dot Award: Product Design has roots dating back as far as 1955 and determines the best products created each year. In 2018, designers and manufacturers from 59 countries submitted more than 6,300 objects to the competition. True to the motto “In search of good design and innovation”, a jury comprising roughly 40 members assessed the products individually based on the original. The strict judging criteria, which include level of innovation, functionality, formal quality, ergonomics and durability, provide a frame of reference which the jurors then complement with their own expertise. A choice of three different distinctions are awarded: The Red Dot: Best of the Best is reserved for the best products in a category, while the Red Dot is the distinction for high design quality. An Honourable Mention is awarded for a particularly well-executed aspect of design work. “I want to congratulate the award winners sincerely on their wonderful success in the Red Dot Award: Product Design 2018. Success in the competition is proof of the good design quality of the products and once again shows that companies are on the right path. When I speak about good design, I am referring to more than just an attractive product. All of the products are characterised by outstanding functionality. This demonstrates that the designers have understood their clients and their needs”, said Professor Dr. Peter Zec, founder and CEO of the Red Dot Award. The winners will be celebrated at the Red Dot Gala on 9 July 2018. The Red Dot: Best of the Best laureates will receive their well-deserved trophies on stage at Essen’s opera house, the Aalto-Theater, during the award ceremony. At the subsequent Designers’ Night in the Red Dot Design Museum Essen, the Red Dot laureates receive their certificates and can all celebrate their success together in the midst of the award-winning products, as the aftershow party is simultaneously the exhibition launch: For a four-week period, the special exhibition “Design on Stage – Winners Red Dot Award: Product Design 2018” will feature the award-winning innovations as part of the world’s largest exhibition of contemporary design. The day of the Red Dot Gala coincides with the publication of the Red Dot Design Yearbook 2018/2019, which showcases all of the year’s winning products. In addition, they can be found in the Online Exhibition, the Red Dot App and on Red Dot 21 from that date.